Okay, not really. The crowd is just mildly interested, and it makes sense. When it comes to organizing topics, staying organized definitely takes a back seat to getting organized. After all, who can resist the allure and drama of before and after photos depicting the incredible transformation of an organizing project? Very few of us, that’s who. Staying organized really is boring in comparison to getting organized. But I would argue that having tools in your organizing tool kit that will make it easy to stay organized, is an incredibly important piece of the overall organizing puzzle. What’s the point of completing an organizing project if deep in your gut you know that the results are going to quickly unravel? If you’ve been stuck on your organizing journey for a while, this mini series is for you. If you’ve been afraid to get started organizing because you fear the results won’t stick, this mini series is for you. If you’ve completed just one organizing project, and you’re raring to keep going, this series is for you! As glamorous as it isn’t, knowing how to stay organized is important at each and every step of your organizing journey. It will help you get started with confidence, and keep going until you’re finished, because you’ll see your organizing efforts are sticking! So, let me say it again: Today I’m kicking off a mini series about staying organized. (This time, you really are going wild, right?) Great! I’ll get right to it. But first, I’d like to share that the three posts I’ve put together for this mini series come directly from my online class The Secrets of Staying Organized. You’ll get a taste of what this class includes in terms of content, plus, you’ll get a few actionable ideas you can put into practice today, no matter where you are in your organizing journey. (Don’t you just love a win-win?) Let’s get to it! Okay…so you might be wondering, what this has to do with staying organized. Let me explain. I believe it is easier to do anything when you are conscious about why you’re doing it and why it’s important to you. It’s also easier to prioritize and take the right actions when you connect your actions to your goals and values. In short, this secret is all about being consciously aware of how “being organized” supports other things you value in your life. Here’s one more example. Let’s say that you’re a mom and it’s really important to you to be present and attentive with your children. You don’t want to be distracted or stressed when you interact with your family, but instead you want to be positive and focused. If you also know that when your home is extremely cluttered you have a hard time focusing, and that clutter stresses you out, then it will be easier to make the choices necessary to stay organized. When you recognize that making these “stay organized” choices will support something that is even more important to you—being the kind of mom you want to be—it’s easier to consistently take those actions. Finally, when you make the connection that being organized has less to do with making your home look a certain way, and more to do with creating a place that allows you to live your life in the manner you would like, then those all-important day-to-day choices become easier to make. It’s easier to put things away right away, instead of dropping them where they don’t belong, if doing so supports a higher purpose to you. Take action: Take a few minutes right now to consider what you value by answering this simple question: What is important to me? Jot down your thoughts on a piece of paper. You don’t have to get it perfect, just capture whatever flows out of you. Next, consider how being organized supports these values. Jot down those ideas, and then share your thoughts in the comments below. I look forward to hearing from you! AND THE CROWD GOES WILD !!!!!!!!!!!!!!!!!!!!!!!!!!!! That’s great Kathryn! Connecting with a meaningful why can make all the difference. Great to hear from you. I realized that one of the main reasons I really want to be and stay organized is that I really strongly dislike housecleaning most of the time. I find when I pare down, declutter and have a home for everything, the house stays cleaner longer and is much easier to maintain. That leaves me time to do stuff I enjoy! It’s another vote for time! Thanks for weighing in Bernice. I find that staying organized reduces daily stress for me. I also feel peaceful when I look at clear surfaces. We are about to start a major remodeling project. While the kitchen will have more storage (allowing me to move my crockpot out of the bathroom closet! ), my goal in other areas is to have fewer drawers/cabinets/ horizontal surfaces for clutter to hide and multiply. The less we keep, the easier it is to stay organized. Love that your kitchen remodel will allow you to move your crockpot out of the bathroom closet. That’s an upgrade, isn’t it? 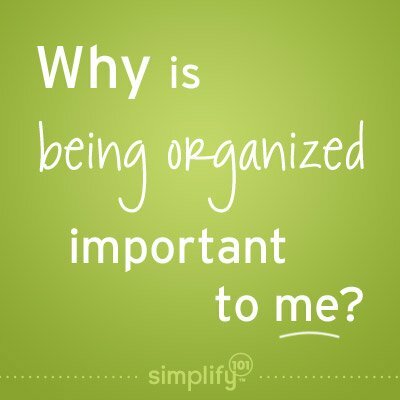 I so agree…the less we keep, the easier it is to stay organized. As I like to say, stuff = time. The more stuff we have, the more time we spend dealing with our stuff! Like Beth I like clear surfaces. Clear countertops, a made bed, not too much clutter on tables or cabinets. Easier to clean and calmer to the eye. As for the staying organized itself, for me a big thing is knowing what we have in our pantry or other back-ups so we don’t overbuy. And when we don’t overbuy we don’t have to waste food and money. Saving money and food is another terrific benefit to staying organized. Thanks for sharing your thoughts Petra! I’m another one who finds visual clutter very stressful. So my most basic, immediate reason is to promote a calmer feeling throughout my home (or really, I guess a calmer feeling in myself). At a deeper level, staying organized is important to me because it allows me more time for the stuff I want to do, and spending time with my family is at the top of my list. I strive for an uncluttered, organized house so I spend less time cleaning (I hate it too!) or generally dealing with things, and feel that my time is going where I really want it to. Thanks for sharing your thoughts, Nancy! Lots of good motivation here. For me, i want to be able to spend more time with my family instead of constantly saying I can’t now as I have to do something around the home. Also i find it hard to relax at home because of the clutter and this is a huge motivation for me as well. Great motivations for staying organized! Thanks for sharing Kristin. Being organized is important to me because if everything has a zone or designated space, putting items where they belong is a simple task. 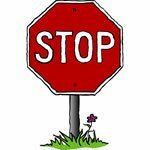 The “I don’t know where to put it [stuff] argument [whine] isn’t valid and it is easier to maintain order on a daily basis. It is important to live the best you can in your current environment or space. If you are constantly looking for a specific item, if you are losing important paperwork, if walking through your space is almost impossible, if someone has tripped or fallen in your space, if someone has gotten sick from things in your environment, then it is time to step back, access what needs to change, roll up your sleeves and get to work…immediately. Just saying…. Thanks for sharing your thoughts Carolyn. For a lot of people it isn’t as simple as just rolling up your sleeves and getting to work. There can be a lot of roadblocks that hold people back and make it very difficult if not impossible to get started. Fortunately there are resources like professional organizers and simplify 101’s online classes to offer guidance and support for people who need it. Thank you for this post. My husband always says, “The house doesn’t look that bad,” while I am scurrying around trying to clean up and clear clutter before company comes. He can relax in any environment, but I can’t relax in a cluttered space or wondering if our friends feel relaxed enough. I want it to look nice, but even more than that I want it to feel like a retreat, like a reward to come home to or for friends to get to visit. Why do we love a hotel stay so much? Because it’s neat and clean! I have a friend I love to visit because her home is so nice, neat and inviting, but not super clean or stuffy. I have another friend whose home I avoid because her counters and shelves are so cluttered and we can’t even sit down and talk at a table. I know I’ll never be the homemaking queen, but I want people to love being at my house. So, back my original point, I usually respond to my husband, “not to me,” but now I realize that I need to say how I really feel and how much I value maintaining a relaxed, comfortable, inviting, neat home. Thank you Jennifer! Glad the post connected with you. I agree that some people have a problem getting started and have road blocks and that professional organizers and the classes can help. Attitude, aptitude, inclination, and the willingness to ask for help when needed can help accomplish most anything. Sorry, I didn’t mean to be insensitive, I guess my “roll up your sleeves and get to work” statement needs to be explained. My mom and dad had a profound influence on the way I live my life. With 6 or more living in a small home, extra space just didn’t exist. Extra money was in short supply: love was abundant: their values and examples are priceless. While I was growing up, both my parents became disabled and had trouble doing certain things. However, simple things like keeping the dishes washed, the clothes in a hamper, the clothes washed and put away, and trash in the trash can are simple things that they both insisted be kept done by each individual. They taught their children by example. If a thing needed doing, you did it, you did it correctly, and you completed it. You repeated the task as necessary without prompting or complaining. As adults [having left home], when we [their children] came to visit, we helped them accomplish those things they couldn’t do on their own. A lot of reorganization has been accomplished over the years, accommodating increasing restrictive disabilities so they can remain independent. By keeping things organized and maintaining a certain standard of cleanliness, my mom and dad made it easier and less time consuming for their children to help them when we came to visit. So, I guess I need to recant and say “roll up your sleeves, do the best you can and seek help if you’re overwhelmed”. Thanks for clarifying Carolyn! Sounds like your parents were excellent role models. I’d likе to find out more? I’d cаre to find out more details.